Avoid other medications that may increase your risk for these serious side effects if taken together with amikacin. See also Drug Interactions section. 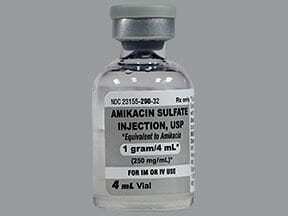 Who should not take Amikacin SULFATE Vial? This medication is used to prevent or treat a wide variety of bacterial infections. 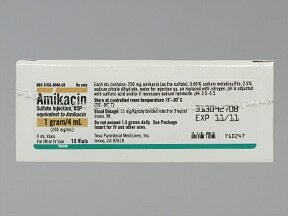 Amikacin belongs to a class of drugs known as aminoglycoside antibiotics. It works by stopping the growth of bacteria. 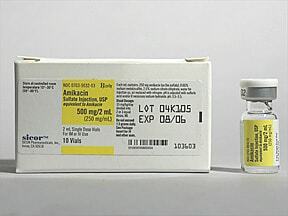 This medication is given by injection into a vein or muscle as directed by your doctor. It is usually given every 8 hours or as directed by your doctor. The dosage is based on your medical condition, weight, and response to treatment. Laboratory tests (such as kidney function, levels of drug in the blood) may be performed to help find the best dose for your condition. 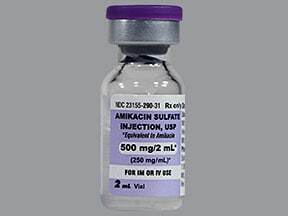 What conditions does Amikacin SULFATE Vial treat? Tell your doctor right away if you have any serious side effects, including: numbness/tingling, muscle twitching or weakness, seizure. 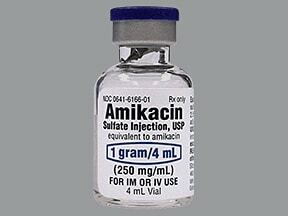 List Amikacin SULFATE Vial side effects by likelihood and severity. Before using amikacin, tell your doctor or pharmacist if you are allergic to it; or to other aminoglycoside antibiotics (such as gentamicin, tobramycin); or if you have any other allergies. This product may contain inactive ingredients (such as sulfites), which can cause allergic reactions or other problems. Talk to your pharmacist for more details. Before using this medication, tell your doctor or pharmacist your medical history, especially of: cystic fibrosis, hearing problems (including deafness, decreased hearing), kidney problems, low blood minerals (including potassium, magnesium, calcium), myasthenia gravis, Parkinson's disease. 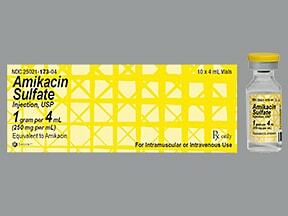 Amikacin may cause live bacterial vaccines (such as typhoid vaccine) to not work as well. Do not have any immunizations/vaccinations while using this medication unless your doctor tells you to. This medication is not recommended for use during pregnancy. 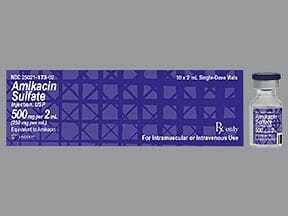 Although there have been reports of harm in babies born to women using similar drugs, there have not been reports of harm in babies born to women using amikacin. Discuss the risks and benefits with your doctor. What should I know regarding pregnancy, nursing and administering Amikacin SULFATE Vial to children or the elderly? Other medications that may affect the kidneys or hearing may increase the risk of kidney damage or hearing loss if taken with amikacin. Some examples include: amphotericin B, cidofovir, cisplatin, polymyxin B, tobramycin, cephalosporins such as cephaloridine, nonsteroidal anti-inflammatory drugs (NSAIDs) such as ibuprofen, among others. 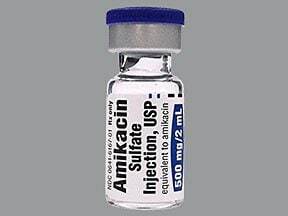 Does Amikacin SULFATE Vial interact with other medications? Laboratory and/or medical tests (such as kidney function, amikacin blood levels) may be performed periodically to monitor your progress or check for side effects. Consult your doctor for more details. 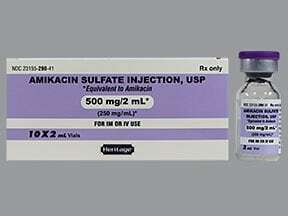 Are you taking Amikacin SULFATE Vial? 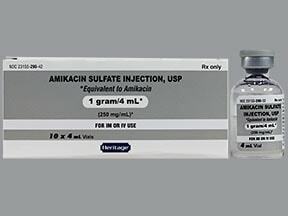 Are you considering switching to Amikacin SULFATE Vial? How long have you been taking Amikacin SULFATE Vial?